The 9th Gyeonggi International Ceramic Biennale (GICB) selected ten prize winners out of 2,470 entries from 76 countries. 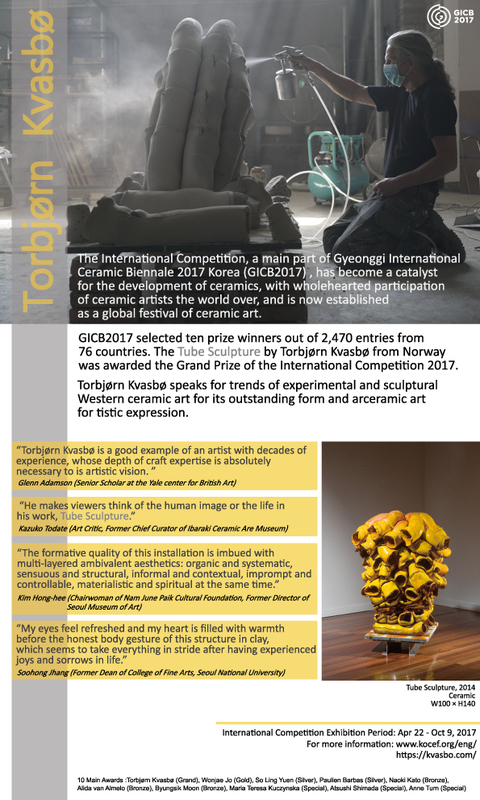 Tube Sculpture by Torbjørn Kvasbø was awarded the Grand Prize of the International Competition 2017. Torbjørn Kvasbø (b.1953, Norway) is considered a leading international ceramic artist and exhibits regularly in Asia, Europe and the USA. He has been exploring the possibilities of clay in terms of building technique, type of clay and firing temperature since the 1970s. Many of his works are associated with organic and monumental sculptures, displaying inherent qualities of the material itself. He defines himself as an Abstract Expressionist. The International Competition, a main part of Gyeonggi International Ceramic Biennale 2017 in Korea, has become catalyst of ceramic artists the world over, and is now established as a global festival of ceramic art.